Future Phone offers a wide variety of business VoIP solutions, with competitive pricing and zero setup costs! Starting from €18,90 per month, you now have the ability to upgrade your telecommunication infrastructure and provide a better experience to your clients. 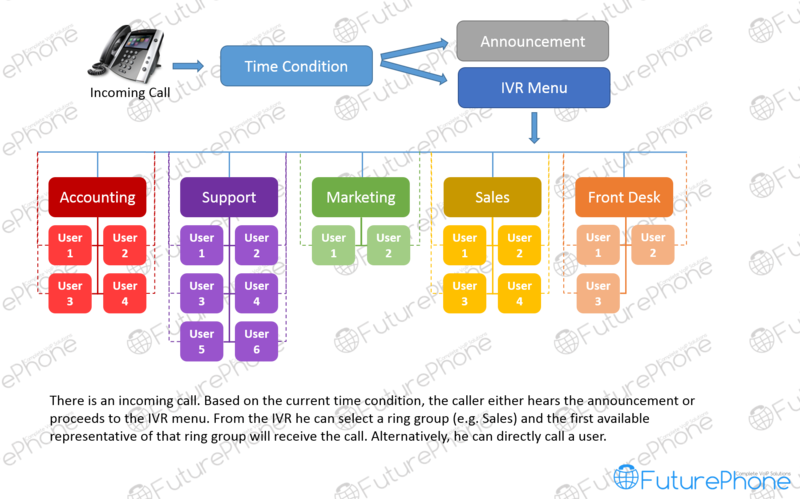 Choose between Announcements, IVR menus, queues, Time conditions, number of extensions and many more options. Configure our solutions to your very specific needs and enjoy Next-Gen telephony! Prices exclude VAT or other applicable taxes and apply for a fixed 12-month period. DID numbers are priced separately and their cost depend on their type (geo-located or toll-free) and country of origin. FuturePhone for Business are prepaid VPBX services, billed each month with the addition of the used talk-time of the previous month. Join the hundreds of satisfied Future Phone users!